The report concerns the effects of marijuana smoking on actual driving performance. 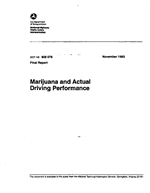 The major objectives of the program were to determine the dose-response relationship between delta 9-tetrahydrocannabinol (THC), marijuana's main constituent, and objectively and subjectively measured aspects of real-world driving; and, to determine whether it is possible to correlate driving performance impairment with plasma concentrations of the drug or a metabolite. A variety of driving tests were employed, including: maintenance of a constant speed and lateral position during uninterrupted highway travel, following a leading car with varying speed on a highway, and city driving. The purpose of applying different tests was to determine whether similar changes in performance under the influence of THC occur in all, thereby indicating a general drug effect on driving ability. See also PB83-219121. Sponsored by National Highway Traffic Safety Administration, Washington, DC. Office of Program Development and Evaluation.